On May 15, 2014, Maryland Governor Martin O'Malley signed H.B. 739, Maryland Estate Tax - Unified Credit, into law. This new law, which repealed and then re-enacted Maryland's state estate tax, made several significant changes that went into effect beginning on January 1, 2015. The federal estate tax exemption increased from $3,500,000 in 2009 to $5,000,000 in 2010; 2010 was also the year that estates could opt out of the federal estate tax rules and into the modified carryover basis rules. As mentioned above, in 2019, which is when the Maryland estate tax exemption will equal the federal estate tax exemption, the federal exemption as indexed for inflation is projected to be $5,900,000. In December 2010, the Tax Relief, Unemployment Insurance Reauthorization, and Job Creation Act ("TRUIRJCA" for short) was signed into law. As part of TRUIRJCA, "portability" of the federal estate tax exemption between married couples was introduced for the first time and applied to deaths that occurred in 2011 and 2012. Then, in January 2013, the American Taxpayer Relief Act ("ATRA" for short) was passed which made portability of the federal estate tax exemption between married couples permanent for 2013 and future years. But what does "portability" of the estate tax exemption mean? In simple terms, portability of the federal estate tax exemption between married couples is contingent on the death of the first spouse. In addition, if the value of the estate does not require the use of all of the deceased spouse's federal exemption from estate taxes, then the amount of the exemption that was not used for the deceased spouse's estate may be transferred to the surviving spouse's exemption. This means that he or she can use the deceased spouse's unused exemption plus his or her own exemption when the surviving spouse later dies. With regard to state estate taxes, however, currently only Hawaii offers portability at the state level, but Maryland will begin offering portability of its state estate tax exemption beginning in 2019. The maximum Maryland estate tax rate will remain at 16%. 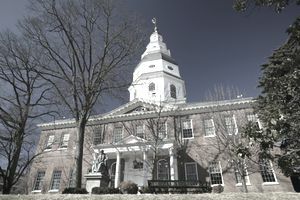 A married decedent's estate will still be able to make a Maryland-only election to treat a trust of which the surviving spouse is the sole beneficiary as "qualified terminable interest property" ("QTIP Trust" for short) for purposes of calculating the Maryland estate tax in years where there is still a gap between the Maryland estate tax exemption and the federal exemption. Thus, married Maryland residents who died between 2014 and 2018 will be able to defer payment of both Maryland and federal death taxes until after the death of the surviving spouse using ABC Trust planning. Maryland is one of two states (New Jersey is the other) which collects both a state estate tax and a state inheritance tax. The new law did not make any changes to Maryland's inheritance tax. Refer to Overview of Maryland Inheritance Tax Laws for more information about this Maryland death tax.